Maine Maritime Museum > All Posts > Collection > Sailor’s Valentines: It’s the Thought that Counts? Authentic is a complicated word. How do you determine if something is authentic? Who has the authority to declare something authentic? What does authentic mean? The exact origins of the word can be traced to multiple languages. The Greek authentikos means “original.” Or to break it down further, authentikos is a combination of autos (self) and hentes (doer, or to accomplish something). Taken together, “authentic” describes the original product of someone’s or something’s action. When determining if something is authentic, is it just the thought that counts or the hand that made it? Sailor’s Valentines are a perfect example of objects with muddled authenticity. 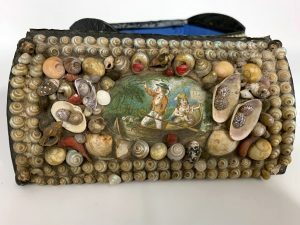 At one time, historians believed that mariners made seashell collages as gifts for their sweethearts back home, hence the name. The most “authentic” Sailor’s Valentines are those housed in octagonal wooden frames and feature geometric designs or wistful sayings spelled out in shells, such as “Forget me not” or “Everthine.” The romantic origin of these objects was debunked when conservators discovered that the majority of these supposedly handmade valentines all shared one thing in common – newsprint backing from the Caribbean island of Barbados. So, if these valentines are not authentic expressions of love from lonely, yet crafty, sailors, then what do they authentically represent? The overwhelming majority of Sailor’s Valentines were purchased as travel souvenirs in the New Curiosity Shop in Bridgetown, Barbados, in the 19th century. So do Sailor’s Valentines represent authentic Barbadian culture? If only geography made it that easy. Barbados, and the Caribbean islands in general, was a hot bed of international trade during the 19th century. The New Curiosity Shop was managed by two English brothers, Benjamin Hinds Belgrave and George Gordon Belgrave. 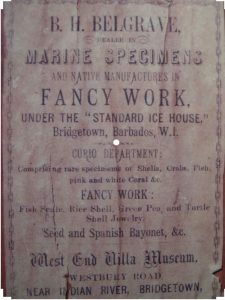 An advertisement for their shop promotes the sale of “Marine Specimens and Native Manufacturers in Fancy Work.” The Belgrave brothers no doubt used the phrase “native manufacturers” to increase the exotic appeal of their wares to international sailors. Nevertheless, it is an apt description; the brothers relied on the local Barbadian artisans to produce the curiosities that stocked their store shelves. Sailor’s Valentines that are not octagonal further complicate these questions of authenticity. The popularity of Sailor’s Valentines in the United States prompted many valentine variations and a prosperous knock-off industry. Want to learn more about these (in)authentic Sailor’s Valentines? Join Sarah Timm, Manager of Interpretation, for the first installment of the On Deck winter program series, Sailor’s Valentines and Caribbean Travel Trinkets, on Saturday, January 26, 2-3 pm. Participants will get an up-close look at Sailor’s Valentines from the Maine Maritime Museum collection and have a chance to make their own just in time for Valentine’s Day. Interested in Maine’s history with the Caribbean? Don’t forget to check out our current exhibit, The Tropics Next Door: A Look at Maine and the Caribbean, on view until May 5. Your ticket for the: Sailor’s Valentines: It’s the Thought that Counts?